YAAC can collect together the various APRS messages corresponding to telemetry data transmitted by some APRS stations and display the current state in a consolidated table format. The table consists of two rows for each reporting station. The first row lists the station callsign, telemetry project name, and the title for each telemetry parameter (defaulting to the APRS standard names if a PARMS message has not been sent). 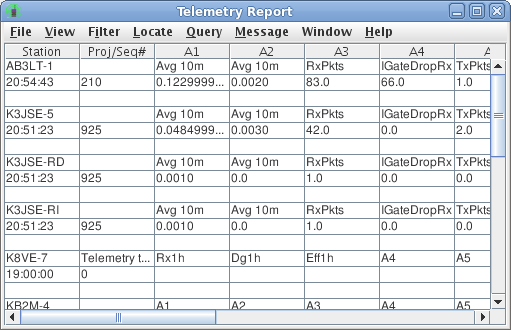 The second row lists the time of day (in local station timezone) when the most received telemetry data was received, the sequence number of the most recent telemetry data, and the rescaled telemetry values (using the scaling coefficients provided in an EQNS message, if any was provided).